Summers Cottage - The Virginia Creeper Trail The Virginia Creeper Trail is a beautiful 34 mile biking, hiking and horseback riding trail (no motorized vechicles are permitted) that starts in Abingdon, runs through Damascus and ends on Whitetop Mountain close to the North Carolina border. The Creeper Trail is an old railroad bed so it is wide and the grade is very easy. Most "Creepers"(there are over 100,000 per year) have a shuttle service (see Bicycle Rentals) to take them from Damascus or Abingdon up to Green Cove Station on Whitetop and then they bike down to Damascus (about 17 miles). The trip back down to Damascus is in one of the most beautiful settings in America - the Mount Rogers National Park. Pristine forests, mountain streams filled with trout, wildlife, trees, and plants, plus more than 30 wooden trestles (there are 47 on the entire trail) all make the trip an amazing visual and recreational adventure for everyone, including children. There are restroom facilities at three locations and refreshments can be purchased at various locations. More seasoned bikers may want to continue the trip all the way back to Abingdon another 17 miles - slightly uphill most of the way. Hardened bikers leave Abingdon, ride up to Green Cove and turn around and ride back to Abingdon - a 68 mile trip! There is a local resident in his 80's who makes the round trip on an almost daily basis and has accumulated close to 200,000 miles on the Trail. If one wants a nice walk - leave Summers Cottage, turn right (west towards the Courthouse), walk two blocks, turn left (south) on Pecan Street, walk about 300 yards to the start of the Trail at the old locomotive. Enjoy a pleasant walk out to the Knobs (a series of large hills) and the Glenrochie golf course - about two miles out and back. HOW THE TRAIL GOT ITS NAME The Virginia Creeper Trail got its name from a play on words. Virginia Creeper (Parthenocissus quinquefolia) is a native five-leaved ivy found growing wild all over Southwest Virginia (and all over Summers Cottage's front fence - it is not poison ivy! See picture below).At some point in the early 20th century, some local punster nicknamed the Abingdon Branch of the Virginia-Carolina Railway that ran from Abingdon to Todd, NC the Virginia Creeper because of the slow speed at which the train had to run to negotiate and climb Whitetop Mountain. The name stuck and came into common usage though the railroad company did not like the nickname and never referred to it by that name. In 1974, Norfolk and Western Railroad, which then owned the line, stopped service on it. It was left abandoned until 1977 when the US Forest Service and the Towns of Abingdon and Damascus secured it for recreational use. And " Virginia Creeper" stayed with the new trail and became part of its official name. MANAGEMENT OF THE TRAIL Today, the section between Abingdon and Damascus, managed by those towns, runs through privately owned land and all trail users should respect the rights of the owners. The section between Damascus and Whitetop is on national park land and is managed by the US Forest Service. 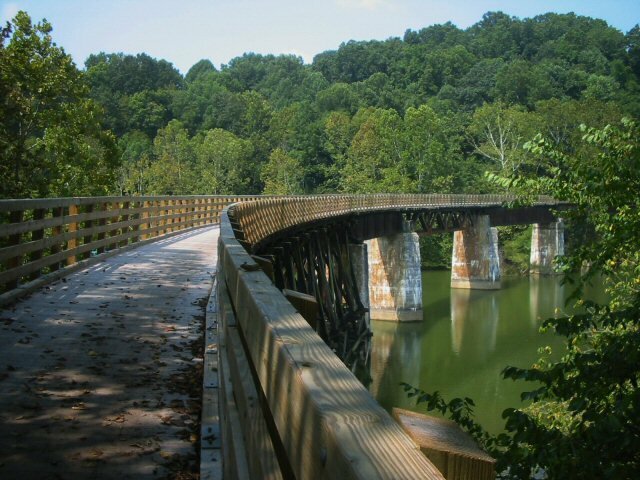 The official website of the Virginia Creeper Trail is www.vacreepertrail.org. The Virginia Creeper Trail is a beautiful 34 mile biking, hiking and horseback riding trail (no motorized vechicles are permitted) that starts in Abingdon, runs through Damascus and ends on Whitetop Mountain close to the North Carolina border. The Creeper Trail is an old railroad bed so it is wide and the grade is very easy. Most "Creepers"(there are over 100,000 per year) have a shuttle service (see Bicycle Rentals) to take them from Damascus or Abingdon up to Green Cove Station on Whitetop and then they bike down to Damascus (about 17 miles). The trip back down to Damascus is in one of the most beautiful settings in America - the Mount Rogers National Park. Pristine forests, mountain streams filled with trout, wildlife, trees, and plants, plus more than 30 wooden trestles (there are 47 on the entire trail) all make the trip an amazing visual and recreational adventure for everyone, including children. There are restroom facilities at three locations and refreshments can be purchased at various locations. More seasoned bikers may want to continue the trip all the way back to Abingdon another 17 miles - slightly uphill most of the way. Hardened bikers leave Abingdon, ride up to Green Cove and turn around and ride back to Abingdon - a 68 mile trip! There is a local resident in his 80's who makes the round trip on an almost daily basis and has accumulated close to 200,000 miles on the Trail. If one wants a nice walk - leave Summers Cottage, turn right (west towards the Courthouse), walk two blocks, turn left (south) on Pecan Street, walk about 300 yards to the start of the Trail at the old locomotive. Enjoy a pleasant walk out to the Knobs (a series of large hills) and the Glenrochie golf course - about two miles out and back. The Virginia Creeper Trail got its name from a play on words. Virginia Creeper (Parthenocissus quinquefolia) is a native five-leaved ivy found growing wild all over Southwest Virginia (and all over Summers Cottage's front fence - it is not poison ivy! See picture below). At some point in the early 20th century, some local punster nicknamed the Abingdon Branch of the Virginia-Carolina Railway that ran from Abingdon to Todd, NC the Virginia Creeper because of the slow speed at which the train had to run to negotiate and climb Whitetop Mountain. The name stuck and came into common usage though the railroad company did not like the nickname and never referred to it by that name. In 1974, Norfolk and Western Railroad, which then owned the line, stopped service on it. It was left abandoned until 1977 when the US Forest Service and the Towns of Abingdon and Damascus secured it for recreational use. And " Virginia Creeper" stayed with the new trail and became part of its official name. Today, the section between Abingdon and Damascus, managed by those towns, runs through privately owned land and all trail users should respect the rights of the owners. The section between Damascus and Whitetop is on national park land and is managed by the US Forest Service.